I already showed you what I packed in my hospital bag. Now I'll share with you what I've packed for the babe! The hospital will certainly have these and will put one of theirs on your little one right off the bat. Personally, I prefer my baby to dress my baby in things that are a little bit cuter than the traditional hospital stuff. I promise you I'll be switching out that hospital cap for one of these cute ones [or one of the other five I packed ha!] as soon as that babe is in my arms. Babe will have his own "Mr. Bunny" but it's obviously an elephant and therefore will not be named Mr. Bunny. Any suggestions? I swear I lose sleep over coming up with a name haha! Anyway, he's going to be with the babe since day 1 so he has been packed into baby's bag. Isn't it adorable? I think I also have two other outfits packed. They grow out of the newborn stuff so fast I don't want to lose a minute of dressing him in these cute little outfits! You might not mind having your babe just wear the hospital onesie during his/her stay but make sure you have at least one outfit for going home. 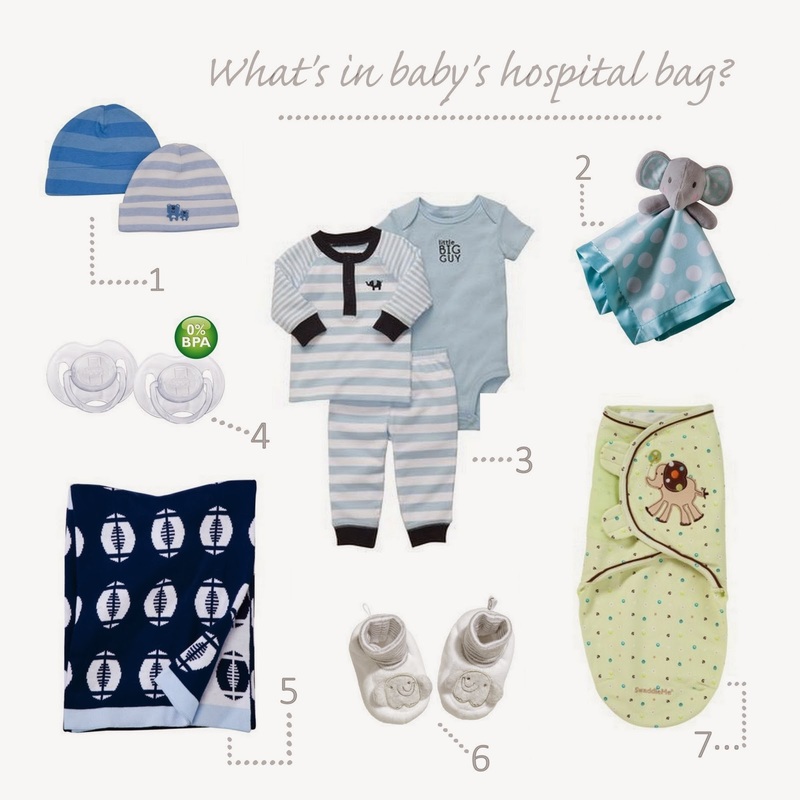 A) it's a lot cuter for going-home pictures and B) if your babe is coming in the winter you might want pants for him/her, which the hospital does not provide. Jack came out of the womb sucking his fingers and I did not want a finger-sucker (after all, you can't take them away like you can a binkie!). Luckily, I had packed my own preferred brand of pacifiers so he didn't get attached to the hospital ones. I mentioned in my baby registry checklist post that I totally don't buy into the idea that babies come out of the womb with a preference for what brand of pacifier they get. Buy the ones you like and the babe will take it eventually! It took Jack a few days to a week to really warm up to the paci but it's a total life-saver now (and has been since week 2). I have to admit I dread the day we take it away. My mother-in-law gave us this adorable football blanket at my baby shower last weekend. I'm 100% convinced that if the baby is all wrapped up in a football blanket when Jack meets him, Jack is going to fall in love immediately. If you knew how much Jack loved football, you would totally believe it too! So this blanket went straight from the shower into baby's hospital bag. I also have a lighter receiving blanket packed in case the hospital is a little too warm to be wrapped up in this heavier blanket. PS YES, the hospital has plenty of receiving blankets (and take them home with you!) that you can use! Again, I just like having my own stuff! Jack was a summer babe and I'm just dying over all the cute, cuddly winter stuff out there. So I just couldn't resist packing a couple pairs of adorable booties for the babe. I'm not kidding you, you should have a couple of these! Make sure you buy the newborn size! I am a HUGE fan of the SwaddleMe blankets. And I totally think it's worth the splurge to get the name brand. Jack slept so great when he was all swaddled up in this. I had brought one with me to the hospital for Jack and he spit up on it so we were swaddling him in the receiving blankets. He kept managing to unravel himself from them (even when the nurses who are PRO SWADDLERS wrapped him up). I had my sister run to Target and get me a second one to bring to the hospital. This time I'm prepared and have two packed into baby's bag. Plus, just believe me that your little newborn will look especially adorable all bundled up like a burrito! Things I packed with Jack that I'm definitely NOT packing this time? Do not, I repeat: do NOT, use your own diapers when the hospital provides them for you! And maybe ask for some extras right before you check out...and take them home! Same goes for wipes. And the hospital has the nice big burp cloths that are perfect to use (and to take home!). Packing your own burp cloths is a waste of space, in my opinion. You would need like 50 anyway. They go through them so ridiculously fast. Let me know if you have any questions! Hope this helped! Name the elephant Ellie or Mr. Ellie!! Congrats again!